Come join Bottlehouse’s month-long program to support local winemakers during the month of March. As they called it, “curated tastings from Washington’s best every Sunday from 4 to 6 PM.” The wines will be there for tasting as well as glass pours and retail specials. Bottlehouse, a wine bar in the Madrona neighborhood in Seattle, is especially near and dear to our hearts, since they were early supporters of Locus Wines. They have featured many Locus offerings by the glass and had our rose, Modo red as well as a special red that we had produced only for our keg program (Locus Tank #2) on tap. Not only that, when the Bottlehouse family expanded with Mr. West (downtown Seattle and soon in University Village mall), they featured Locus Wines in some of the new establishments as well. As part of the Washington state wine month, all Locus wines are going to be on display at Bottlehouse on Thursday, August 20th, along with the winemaker Rich Burton. Rich will also debut the first public tasting for the upcoming Keller Vineyard Syrah. Visit the Bottlehouse website or just show up. There is no cost for this tasting. The ‘firsts’ continue. 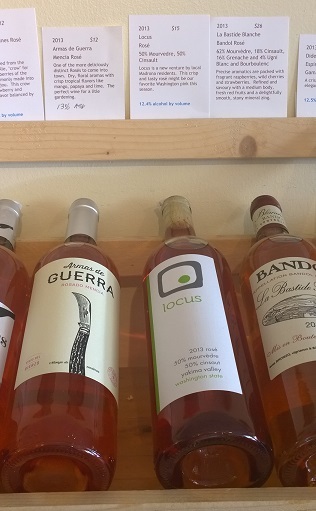 Locus Wines’ 2013 Dineen Vineyard Semillon is now on the wine list at St. Clouds, the ‘contemporary comfort food’ center of Madrona universe, in Seattle, WA. St. Clouds was actually where Locus Wines officially released its inaugural wines back in July 2014. Check out St Clouds website to learn more about the restaurant or simply make a reservation. Our first retail location is in our home neighborhood of Madrona, near downtown Seattle: All three wines are available at the Madrona Wine Merchants, located at 1127 34th Ave, Seattle, WA 98122. The two proprietors, Jim and Mark specialize on wines with exceptional quality, complexity and distinct style at reasonable prices. Check out their blog and website when you get a chance.